There are useful lessons and accompanying audio files so you can hear the pronunciation. 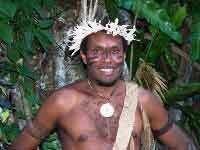 Ni-Vanuatu use the words "Good Night" (gud naet) as both an evening greeting and to say farewell in the evening. In English we may say Good Evening as a greeting and then Good Night as farewell. English: Where is the Post Office? Bislama: Pos Ofis i stap long wea?